Finally an affordable Mobile DVR that is easy to use and reliable. This system included a commercial grade mobile DVR that has a built in 4.3-inch secure screen for instant play back if needed. This mobile DVR also uses 2 standard SD cards so you can easily move the recoded data to a computer for backup or replay. This is the best mobile DVR for an RV for 5th wheel because it also allows you to continue record when the RV is parked. 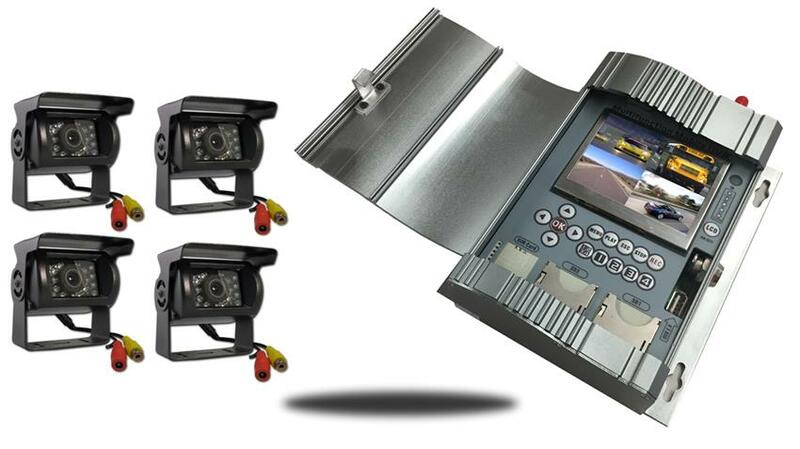 Many of our client have used this rear view system for surveillance of the area around where they park. The DVR also has a video output, this allows you to upgrade and add a large screen to put on your dash or hang from your ceiling. Once you install the mobile DVR with all 4 camera you will be able to also record while you’re driving down the road or if you wish, have it pop on only when your RV is going in reverse. If the configuration of rear view cameras on this backup system doesn’t exactly fit your needs, please don’t hesitate to give us a call at 866-966-5550 and one of our mobile DVR specialist will gladly assist you, any day of the week. The DVR records onto an SD card. You can put 2 SD cards in the DVR at a time. So you can record on one and pull out the other. It is very easy to get the information over to a computer, simply pull out the card and take it to a computer. You can also lock the DVR closed to protect the SD card. This DVR is compatible with ALL our cameras its just a simple connection. You can always feel safe too as the DVR locks and only you have the key. Its also shock resistant which makes it great for any vehicle from a Taxi to a Tow Truck. Its very easy to set up. The 4 DVR cameras Have a 120° Degree viewable angle, they are 100% waterproof and has auto night vision. The backup camera is one of the most durable we have, with incredible adjustability and night vision clarity. The RV Box backup camera has a metal sun shield visor to protect you from glare and pebbles. This is by far our toughest built backup camera. It has been regularly used in cars, vans, buses and even industrial sized caterpillar trucks, operated in the harsh oil sand of Canada. This backup camera can take a direct hit from a rock and it will still work like new. It has also been very popular with RVs, because its housing allows you to install the backup cameras on multiple sides of your RV. You can also get an internal camera to record the inside of your vehicle. "We outfitter all 100+ Fork lifts with cameras and at the last minute were convinced to add the DVR feature with the SD Card (they said it would be easier to transfer the videos if needed) and it was worth every penny. First lets state the obvious our warehouse crew is less likely to "Lightly Tap" our merchandise and cargo when they know every second the forklift is operational is recorded. It has also done wonders for the safety because our drives have a live 360 degree view while the vehicle is on and whatever they see, we record. I highly recommend this SD DVR"